no free lunch, or is there? One of the oddities of where I live is that we have a lot, a lot of American-Mexican places to eat. One of the places I go frequently is Moe’s. One of the features of Moe’s is that when you walk in they yell, “Welcome to Moe’s” and then that call is echoed by other workers around the store and even by some people that are eating. Funny or Freaky depending on your preference. So it’s already a unique experience. So at my table was a table-topper that says. Now that’s awesome. What’s there to it? You register online and get a free burrito. [If interested you can do it here] Who doesn’t love a free burrito? Now the adage “there’s no free lunch” applies here, since when I sign up to get my burrito I’m actually paying with the information I supply. In short, it’s simply a great example of a relatively unobtrusive way to create a connection with a customer (and learn a lot about who is buying/visiting your stores). 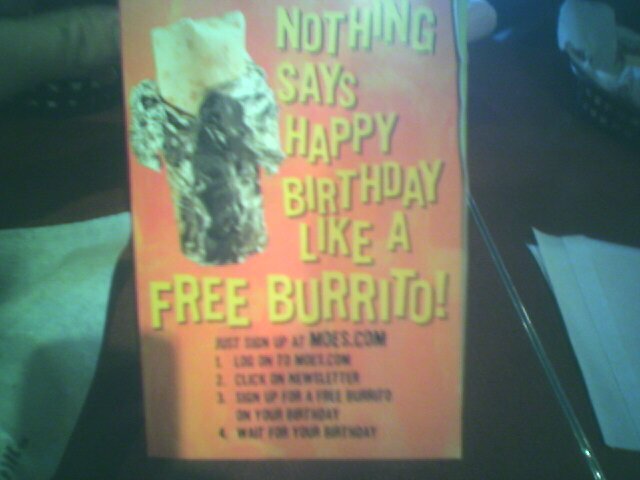 It may not be completely free, but it will be a nice birthday burrito.